When I left Edinburgh Friday morning, I only knew that I was going to Aviemore and that I wanted to camp in the highlands. After a delightful train ride through Fife and into the highlands, I went to the information center in Aviemore where a nice lady gave me a guide to Glenmore Forest. I hopped a bus to Glenmore. Now, I should note that there were heavy clouds over the mountains, so I couldn’t really see them at this point. But I knew that the mist concealed wonders. Upon reaching Glenmore Forest, I again went to the information center and told the lady there that I would like to camp. I realize that those of you who have hiked in Scotland will scoff at my next comment, but I had no idea what a bothy was. And, in that moment, I didn’t ask. I just grabbed my gear and started walking. Unwise, you might say. Not doing your research. As an English teacher who has taught research for twenty years, I have to agree with you. But, not asking that question created a miraculous moment for me. After reaching the beautiful Lohan Uaine, I stopped at took some pictures. The green water shimmered beneath the gray rock and hovering mist. A number of other people were there as well taking pictures of the green loch. Then the sun began to break through, and the hills revealed themselves more and more. 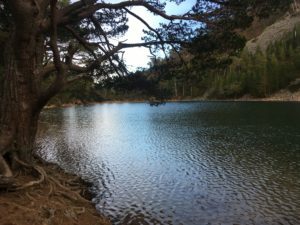 The Lochan Uaine in Glenmore Forest matches its name. The emerald waters are mystical. To see more of Glenmore Forest, check out the video below. Everyone seemed to invigorated by the sunlight. Apparently, it had been a rough few days before with snow and mists. I started up the trail, continuing to take pictures, and made my way to my impending camp site. I knew that I would need time to set up, find water, and start a fire. I walked up a rocky path that had become a tiny stream due to the melting snows. The trees began to become sparse. Only the heather, wearing its winter colors of brown and gray, reigned here. As came to the top of the hill, I saw a tiny stone cottage. I looked at the map, looked back at the cottage, and started laughing with a mixture of amusement and joy. Only in a state of not knowing can one discover anything. A bothy is a way station for travelers. I had just found out that I wasn’t going to be camping in a tent that night. And I was thrilled. It seemed like a dream come true to be able to stay in such an idyllic location. I felt transported into the past. The single room was quaint. There were candles left by previous users, a little table, and small fireplace. I set down my gear and started preparing. I found a mountain stream just beyond, filled my pot, and boiled the water. Then I foraged for wood. I had bought a small saw in Edinburgh, but I knew that I didn’t want to harm live trees. I would have to find dead wood. That became a serious challenge. I would have to go 3/4 of a mile back to the woods and go off path to find some wood that I might use, but it was wet. I grabbed it and carried it back anyway. I was still experiencing a euphoria that I was here, in the highlands, preparing to spend the night in a bothy. I cut the wood, got a fire started with some dried heather, and had some dinner. As the night came on, the temperature plummeted. I would later find out that it was -16 degrees. I need to give credit to Half-moon Outfitters in Charleston. They sold me a sleeping bag and insert that literally saved my life that night. The cold killed my fire, it ate the battery life in my phone and in my charger, it swirled around the bothy and clawed at the door and window, and it sought every opportunity to reach any exposed skin to bury itself deep within my flesh like a dagger. It was the coldest night I have ever experienced in my life. At one point, I felt the need to use the bathroom. I considered waiting until morning, but finally I decided that I just had to go. I tore myself out of my cocoon of warmth, I danced about the cabin throwing on every article of clothing I could find, and then I burst through the door into the night. At that moment, I forgot everything. I looked up and saw the night sky as it truly is, and I was overwhelmed with the amazing beauty of it. I thought of Ralph Waldo Emerson’s Nature. Emerson’s point was that mankind fails to see the miraculous that exists everywhere around him. Whenever I taught Emerson, I would always tell my students about the first time my daughter, McKenzie, touched grass. To me, it was just the lawn that I had to cut. To her, it was a green and brown blanket of wonder. But that moment, that miracle, can only be glimpsed in those moments when we aren’t looking for it. We take the beauty of ourselves and the world around us and think that it is common place and perceive it as menial. After relieving myself ever so quickly, I went back inside and made some more hot water to give me some warmth. I returned to the night, the cold, cold night, and basked in her glory. When I went back inside, I wrote Stella at Tyvoan Bothy. I meant it in so many ways. So gorgeous. Again, thanks for sharing this journey. I was thinking of Stella as I viewed this video and shed a tear.